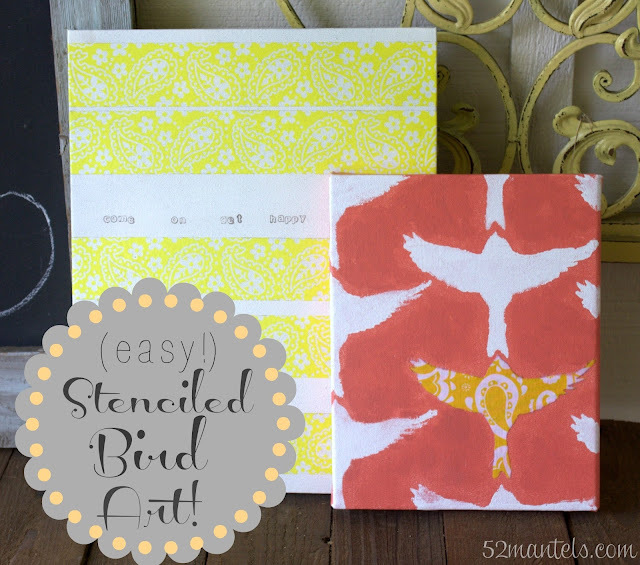 Last month I shared this tutorial for easy Stenciled Bird Art at I Heart Nap Time. If you remember last month, I also shared a stenciled bird rug tutorial for my back porch. 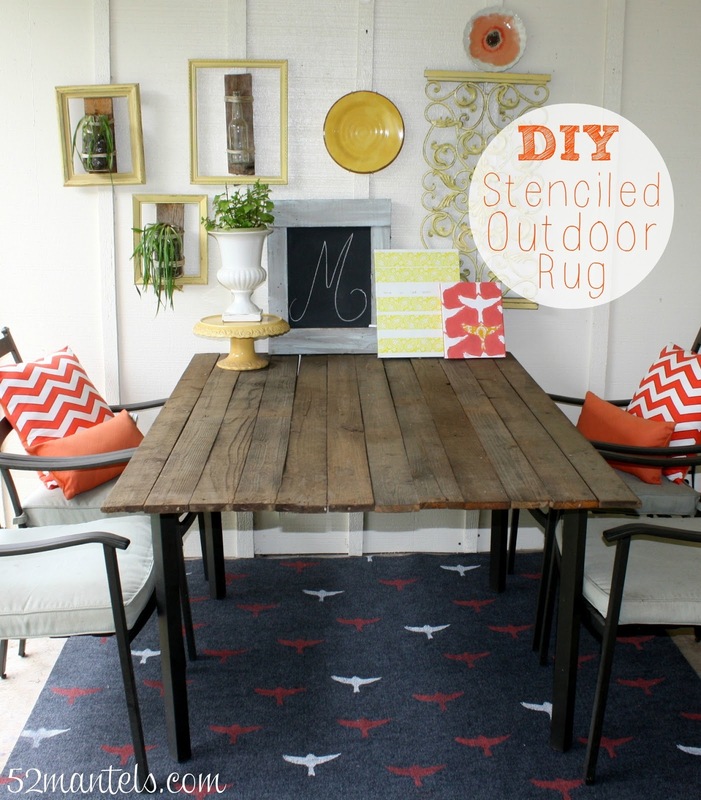 This artwork ties in the birds from the rug and is a nice addition to my Summery porch! To make this artwork, I used a freebie stencil I received with a wall stencil from Cutting Edge Stencils, but you can use any stencil you like! Choose one that is small, simple and symmetrical (ish) for a geometric look. Your local craft store should have plenty to choose from. 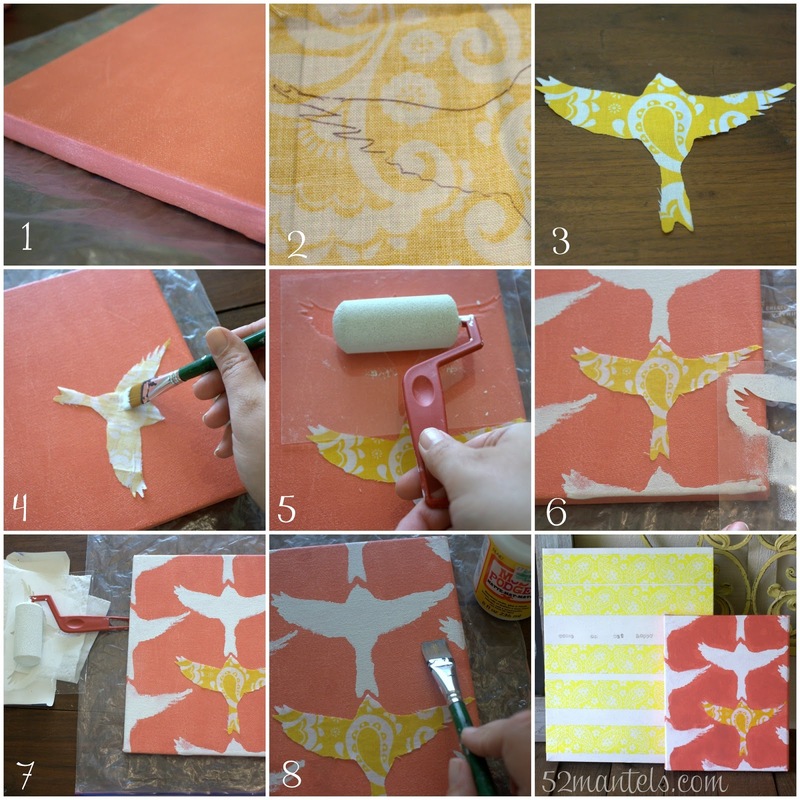 1) Paint canvas and let dry 2) Flip fabric over and trace stencil on backside 3) Cut out stenciled element 4) Mod Podge fabric onto canvas 5) Position the stencil over fabric. 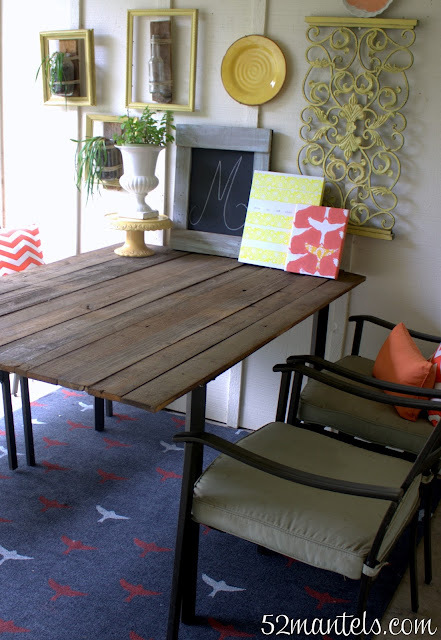 Take roller brush and roll in paint and then roll the brush over paper towels to remove excess paint. Fill in stencil with paint. 6) Repeat stencil to fill in canvas. Let the stencil hang over the edges on sides. 7) Let canvas dry. 8) Paint Mod Podge over entire canvas to seal. The packing tape art was made last Spring and has held up great on my back porch. The tutorial is here if you're interested in another easy art project! As you can see, I didn't bother to wrap the stencil around the edges of the canvas. I was going for easy-breezy! Here's a look at my completed porch! The rug tutorial can be found here. 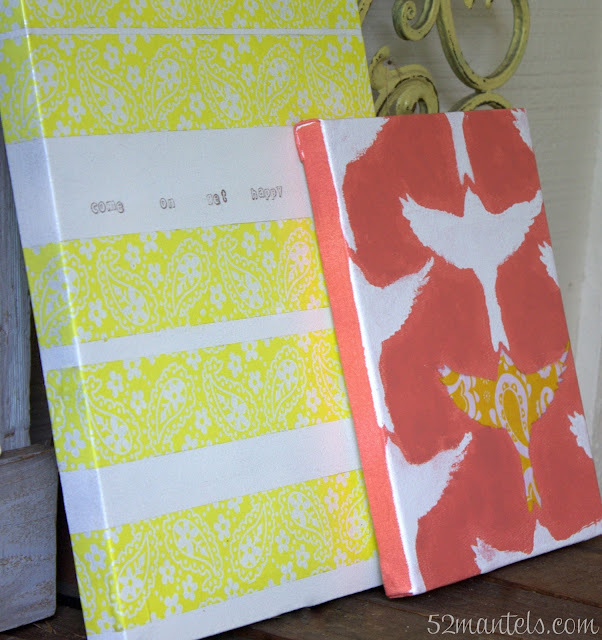 I just love the splash of coral and yellow from this simple art project. **This project was originally posted at I Heart Nap Time. I love this! I saw it when you shared on I heart naptime. I was wondering where you got the chevron outdoor pillows. I want them! I got the pillows on clearance at Hobby Lobby. But, unfortunately they aren't outdoor pillows. Luckily, my porch is covered and stays pretty dry! I love your porch! Love the artwork!! Love it!! That's super cute! I love how that turned out! Additionally, verify whether the moneylender charges prepayment punishments. Paying off automobile title credits early can spare you a great deal of cash in premium, which is obviously further bolstering your good fortune.